Nurse with Wound played a haunting set in a dark auditorium against a sinister black-and-white film backdrop. Ambient drones were punctuated with harsh, sudden crashes -- reminiscent of the sound of a door slamming shut, again and again. The series of images onscreen became increasingly sinister and disjointed as the performance progressed: A person slices open a fish. A man and a woman kiss; the man's face becomes grotesque. Someone gnaws on a slab of meat. Various things get set on fire -- buildings, people. A woman strokes a black cat. A plate of half-eaten food appears. Chairs fall from the sky, reminiscent of the tornado scene in Wizard of Oz. Nurse with Wound's queasy, uneasy vibe was one that would be echoed throughout the music of the festival. Demdike Stare, an eclectic duo from the UK that combine dubstep vibes with drone, dub techno and a record collection that goes deep into African and Arabic music, played an absorbing set in the cavernous environs of Montreal's Société des arts technologiques (SAT) that could best be described as trance-like, almost ritualistic. A few doors down, the much buzzed-about UK producer Actress -- a.k.a. Darren Cunningham -- played a transfixing live set that was sadly hampered by a lack of an engaging stage presence. 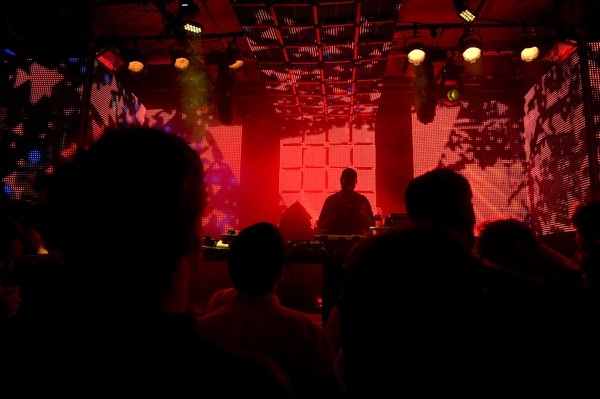 One of the difficult things about MUTEK -- with its emphasis on live electronic music, as opposed to DJ sets -- is that many of the performers play live sets with laptops, and five straight days of watching laptop-based electronic music can get tiresome. There are many ways to get around the tyranny of the laptop, of course. 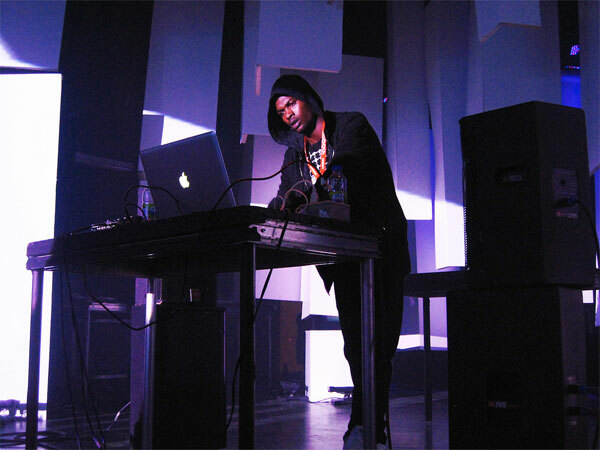 Several of the performers at MUTEK incorporate other hardware -- samplers and so on -- with laptops, making it more of a dynamic experience; some dress in crazy outfits (the New York group Konque donned white space suits and plastic face masks); some use films, light shows, or other visual backdrops; some just dance wildly behind their glowing Macbook screens. Actress just stood there, which was too bad, because his intriguingly low-fi dance music is beautiful -- hazy, eerie, and smeared with memory, like dubstep filtered through dust and refracted through the lens of early '90s rave. One of the most memorable parts of MUTEK is traditionally the Piknik Elektronik, a daytime dance party in Montreal's Parc Jean-Drapeau that takes place under an enormous Alexander Calder sculpture (L'Homme, built for Montreal's Expo in 1967.) This year, an epic rainstorm made the Piknik difficult to manage, but the crowd soldiered on, dancing in ponchos and umbrellas to the sounds of Minilogue and DJ Koze. 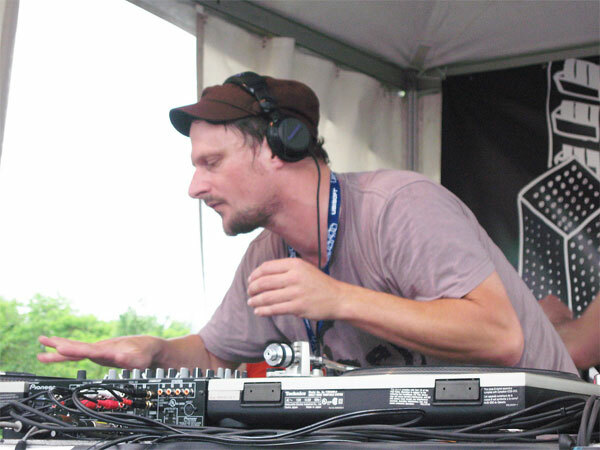 You never know quite what to expect from DJ Koze, which is part of the reason why he's one of the most interesting DJs and producers in Germany at the moment. Over the years, Koze has been a hip-hop DJ, a producer of epic techno tracks, and the architect of hilarious stunts (he once did an over-the-top cover of "We are the World," in which he sang all the voices himself.) In Detroit a week earlier, Koze had played a rocking techno set; here in Montreal, in the pouring rain, he was playing big, jazzy house records, and disco. 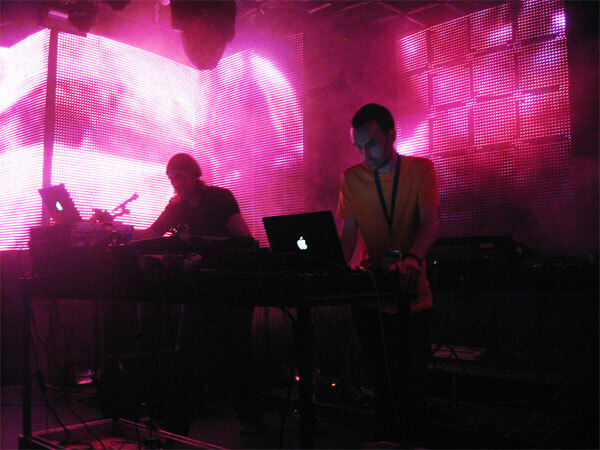 Many other acts at MUTEK --- there are far too many to list here -- were spellbinding. Some didn't get the audience they deserved -- Move D, aka the artist David Moufang, played an achingly gorgeous set early on Saturday night when people were still gathering, and the volume levels didn't seem high enough. The Moritz von Oswald Trio -- an avant-garde supergroup consisting of Moritz von Oswald (best known for his work as part of the legendary German techno imprint Basic Channel), Sasu Ripatti (better known as Vladislav Delay), and Max Loderbauer -- also weren't turned up loud enough; their subtle, finely-wrought sounds were drowned out by the noise of a hundred conversations. Some of the most enjoyable moments at MUTEK were less about pushing the limits of electronic music and more about moving the dancefloor. The Berlin DJs and producers Henrik Schwarz and Dixon played strong late-night sets, soulful and lyrical, and heavy on house. The Detroit legend Theo Parrish closed MUTEK late on Sunday night with an impressive DJ set, also heavy on house. Parrish went all over the map, playing everything from Steve Reich's "Electric Counterpoint - Fast (Movement 3)" to The Police to the little-heard 1986 Chicago house gem "Beyond the Clouds," an ethereal eight-minute-long Mr. Fingers track that was originally the B-side of the classic house anthem "Can You Feel It." Parrish dropped in several of his own house tracks along the way, leisurely winding his way through an entire alternate history of dance music of the course of a few hours. It was a beautiful end to a festival that has become an institution -- not just for Montreal, but for the world of electronic music. 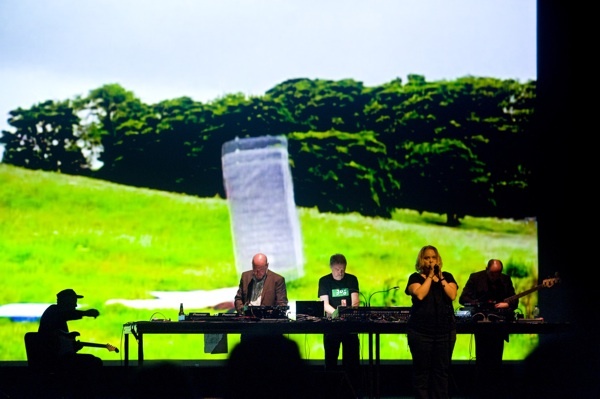 Does anyone know who did the films during the Nurse with Wound show? Or know who I can talk to to find out? I'm desparate and want to see these films again!